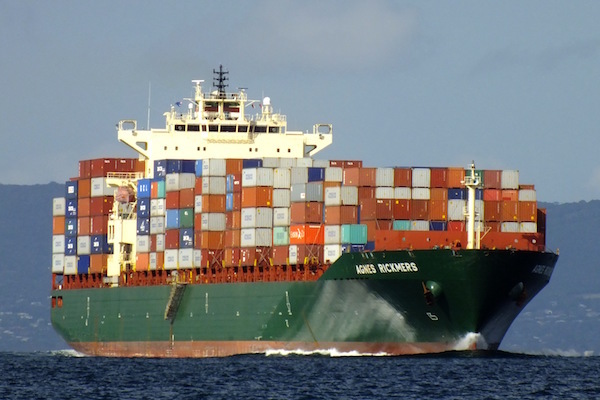 Containerization, do we need container-carriers? In maritime logistics containers and container carriers are not really new. In fact, containers in IT are a concept which is 1-on-1 derived from these physical containers. We have seen and read many good and informative blog-posts and presentations about this. Obviously there is a lot of confusion about this as well. In my opinion you should be careful to mix and match too intensively. I think containerization and micro services, for instance have a lot less in common that some would lead you to believe. This though is not what I wanted to discuss. I would want to argue that one can containerize a stack too deep (or too high, depending on your viewpoint). A container, typically, is an isolatable element which can be stacked upon another isolatable element. For instance, a Webserver is stacked upon an instance of bash, stacked upon it’s dependencies, creating an container stack which is capable of serving http-requests at port 80 of the up-address inherited from the IP-stack underneath the bash-instance. Well, logical. Repeatable, but in a sense also complex, complexity by the sheer number of layers that compromise the stack. Wouldn’t it be an idea to extend this train of thought and also introduce container carriers? Just like in the analogy with container carriers in maritime logistics, these would be larger founding blocks on which various containers can be stacked. How would this differ from a setup with a regular VM? You would still have the lightweight, easily transportable qualities of containers. How would this differ from just stacking containers to create this? It would enable further development of seamless integration of the founding layers of what this container carrier is made up of, improving stability and specialization. It eliminates the feeling of wheel-reinvention that for me, somehow still remains lingering around software containers. With the ever growing adoption of container technology, as the foundation for cloud-infrastructure, it can for a quick cost-saver. Riga Dev Days 2017, new experiences in many ways. It has been a while since my last blog-post. One of the reasons is my shift from closed to open source software, databases more specifically. More on that in a later blog-post. The reason for already mentioning this is this strange hybrid (what a popular word, these days) situation that I am in at the moment. Thanks to the super enthusiastic, flexible and tenacious organization-team of the Riga Dev Days, I was able to participate. Happily boarded the Air Baltic flight, I went on my way to Riga!! Being new at the broader conference scene, I enjoyed being at a mixed source developer conference. Besides the usual suspects – some of which are my best friends – I got to meet many interesting new people. With a day like this, time flies. Between session (and during sessions) there are discussions, a bit of work and catching up to do. Still I managed to catch a few sessions, like the one from Michael Hüttermann who made a clear and well rounded case regarding CI/CD in a DevOps world. A nice insight into the effort that goes into what’s behind the proverbial “push of a button”. Another example was that by Marcos Placona about the many (and very basic) things that you have to keep in mind wen building apps. There is no silver bullet and the best you can achieve is to discourage the hacker so much, they move on. Much like securing your house, do to speak. 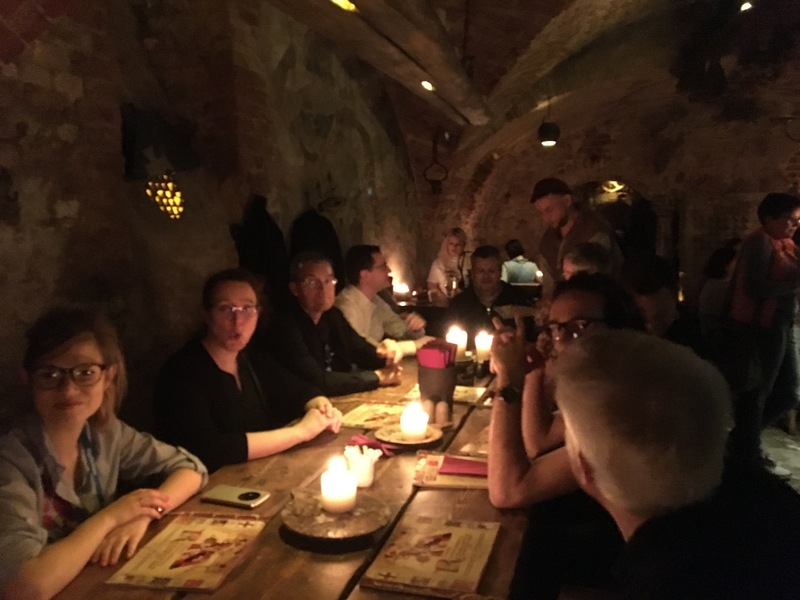 The day ended in the medieval basements of Riga, where we had some really good medieval food. Life is good…, well…, it has it’s moments! The keynote address by Edson Yanaga, which kicked off day two of the Riga Dev Days, was quite interesting. Shortening development and deployment cycles and shrinking feature release sets actually helps improving software and deployment quality by creating faster and more accurate feedback loops. By looking at these concept in this way, buzzez like DevOps and Agile actually get some hands and feet. One of the lessons, though, is that doing things this way do not eliminate work or automagically solve various issues for you! It will help in getting predictability and continuity into your software development processes. Another talk I was able to attend was around Blockchains. Something I knew nothing of and was actually quite interested in. Nick Zeeb took us through a very lively and very animated tour of what actually a Blockchain is and what the awesome potential of this technology can be. I was impressed. With this, the second day draw to and end and therewith also my turn “in the pit”. As this event is held in a movie-theater, every room had a sloped tribune, which was often packed with enthusiastic participants. I had the opportunity to share my thoughts on the comparison between PostgreSQL and Oracle. The session was very well attended with a lot of questions regarding the possibilities of using these other technologies in scales that were not really considered before. You can find a recording of the actual presentation here as soon as it comes available. Riga Dev Days was a good conference. I would recommend everyone to either attend or submit an abstract for their event in 2018! !